J. silbergliedi specimen, Smithsonian Institute. Description: About 8 to 12 mm in length. Dorsal side is mostly dull brownish black. Eyes are red. 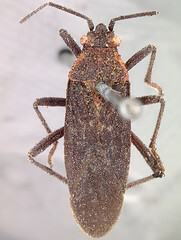 Area around eyes, some of pronotum, and scutellum are orange. Ventral side is yellow and black.